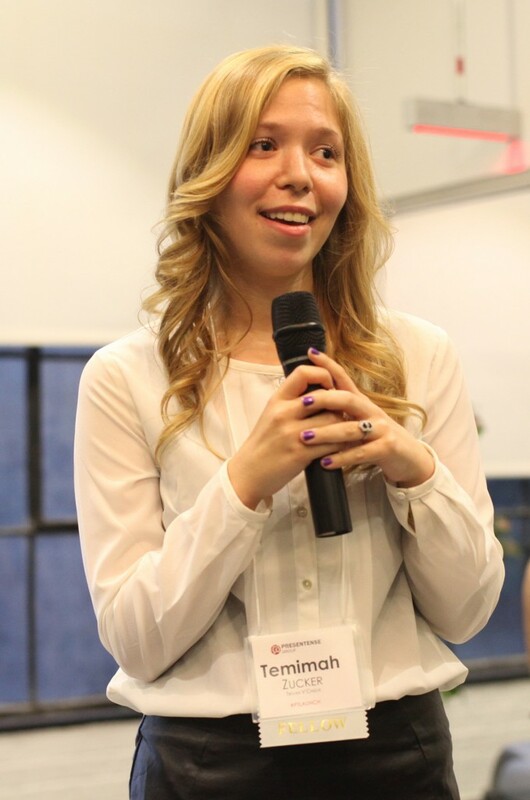 Blogging, public speaking, running a website, counseling patients and volunteering: It’s all in a day’s work for Temimah Zucker, 24, a student at Yeshiva University’s Wurzweiler School of Social Work. Zucker, of Teaneck, New Jersey, is a recovered anorexic who has chosen to dedicate her career to helping raise awareness of eating disorders, particularly in the Jewish community, by sharing her story with others and working professionally as a social worker to help those who suffer from this potentially fatal disease. Eating disorders—which affect people of all ages and ethnicities and have the highest premature mortality rate of any mental illness—are often kept hidden, complicating treatment and prevention efforts. Zucker was diagnosed with anorexia in 2008 when she was a freshman in college, but suffered in silence for months as the disease took a toll on her body and mental health. It wasn’t until her parents showed her “Hungry To Be Heard,” a documentary produced by the Orthodox Union, that she realized she was not alone in her battle, and that there were treatments available to help her recover. She has come a long way. A few years ago, when her therapist asked if she wanted to accompany her to a school presentation about eating disorders, Zucker accepted the invitation and told her story publicly, for the first time. Since then, Zucker has shared her story dozens of times, at schools, shuls and community centers. She’s also developed her own program on eating disorders and healthy body image, which she presents in schools throughout the country. In 2012, she started a peer support group for Jewish teens recovering from anorexia. After realizing that there was still a widespread need for additional support and resources, Zucker launched a website in 2012 called Tikvah V’Chizuk (TVC), which in Hebrew means hope and strength. Last July, she completed an online crowd-funding campaign with the help of PresenTense and raised more than $6,000 to relaunch TVC as a not-for-profit organization with an advisory board. The website is now under construction, but once operational, it will provide resources, articles and discussion forums to support people with eating disorders. Earlier this month, she was recognized as one of the “Forward 50” for her work in the field. She’s been interviewed by NBC News as an expert on eating disorders, and was profiled in Glamour Magazine. Another outlet for Zucker to spread her message is through writing. Her work—mostly personal essays—has been published on The Times of Israel and The Huffington Post and was featured on the Glamour.com guest blog. She also writes a weekly mental health column in the Jewish Link of Bergen County, a local newspaper in Northern New Jersey. Now completing her final year at Wurzweiler, Zucker continues to develop her practical skills and gain more experience in the growing field of eating disorders. She also serves as the student liaison for an international association of eating disorder professionals. In the last few years, Wurzweiler and the Ferkauf Graduate School of Psychology hosted two conferences addressing eating disorders, and the schools are training more psychologists and social workers to diagnose and treat people. Zucker currently works as a counselor at EDTNY Monte Nido, an outpatient center for eating disorders, and plans to continue in that line of work after she graduates in May.